What do you mean by 'only on a beat'? As in you can't hear vocals if played from your computer? I can't hear vocals at all, and I can only hear music whenever bass hits. hmm...how's the quality from your calc? It should be fine since calc songs are really only a set of beats...like midi files. I'm afraid to connect it without the resistors. Do you think it's safe? Depends; if you use the piezos, you may get buy without damaging them; if you use the car speaker, you will kill the transistors. But the calc itself won't be in any danger? ...You are using NPN transistors, right? Yes, they are NPN. I got the 15-pack that you posted. I couldn't hear anything from the calc. I think it's still just too quiet. On my comp speakers, I have to turn up the sound almost the whole way for sound to come out of the piezzo. 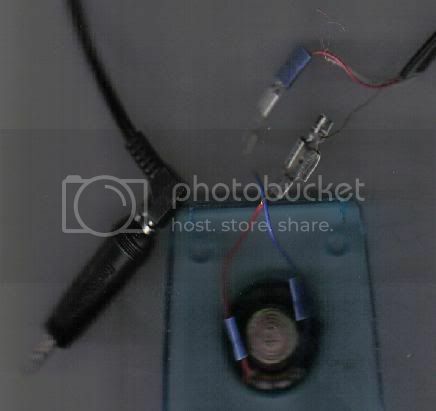 Try this then: connect the piezo directly to the tip and the base of your cable, and once you've started the program on your calc that plays music, plug it in and tell me if it sounds any better. EDIT: It won't work on my comp, either. Post pix plox? We can help you debug the circuit. Hmm... It works on my comp now. Must have been a loose wire. Let me check the calc. Nope, still nothing on the calc. I'm still gonna say your calc has insufficient current to drive it. Does it require you to turn the volume way up on yourt computer? © Copyright 2000-2019 Cemetech & Christopher Mitchell :: Page Execution Time: 0.462863 seconds.